French President Nicolas Sarkozy has won international plaudits for brokering a truce between Russia and Georgia over the conflict in South Ossetia. Can the French president bridge the gap between Europe old and new? There is broad agreement in the French press that it is in Europe's interest for it to succeed, but some commentators have misgivings about the nature of the deal. Mark Semo, writing in the left-wing Liberation on Thursday, said "the ceasefire may be weak, but at least it has the advantage of existing". He noted that although EU foreign ministers meeting yesterday to discuss the deal commended the efforts of the French - who hold the Union's six-month rotating presidency - they "remain divided on what policy to pursue regarding Moscow". This theme was pursued in the paper's main editorial, which said that Europe is "divided between old and new member states" with the first "being understanding towards Russia, the second not at all". These divisions were perceived as having complicated Mr Sarkozy's task of representing the EU in Moscow this week. Yves Theard in the centre-right Le Figaro said that "the Europe of 27 members states is not well placed to curb Russian confidence. "Too many countries, freed from the yoke of Moscow, are driven by a desire for revenge against Russia to allow for a calm, united and consensual European diplomacy. Poland and the Baltic states are not ready". Pulling in the other direction were the older members who "want to avoid any impression of an anti-Russian coalition" as they depend on Russia for energy supplies, said Francoise Crouigneau in financial daily Les Echos. This "mosaic of interests" within the EU, as much as Russian military strength, made the "shuttle diplomacy between Moscow and Tbilisi a high-risk exercise," she said. For Christophe Barbier, editor of L'Express weekly, the conflict and the manner of its resolution have "vindicated" the old Europeans, but he added that the truce is a victory for the EU as a whole, as it showed that it "can speak with a strong voice for balance and for peace". Others were more sceptical and wondered whether Mr Sarkozy had been able to do anything more than present a diplomatic gloss on a Russian fait accompli. In left-of-centre Le Monde, Arnaud Leparmentier noted that Russian President Medvedev "announced the end of hostilities before Mr Sarkozy had even landed in Moscow". 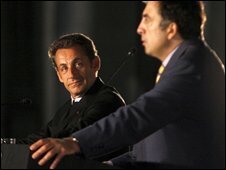 In an article entitled "Medvedev imposes his peace on Europe", Liberation's Lorraine Millot wrote after Mr Sarkozy's news conference with Mr Medvedev, that "judging from the grave expression on his face, it seems that the French president was aware that he had swallowed everything the Russians told him". Mr Theard, however, said that the agreement, while imperfect, was a step in the right direction. "Mr Sarkozy isn't claiming to have solved the explosive problem of the Caucasus - the status of Southern Ossetia and Abkhazia will be resolved later," he said. In his opinion, "no other attitude would be sensible" in the context of a resurgent Russia and an overstretched US that "doesn't want to open up another front against Russia".